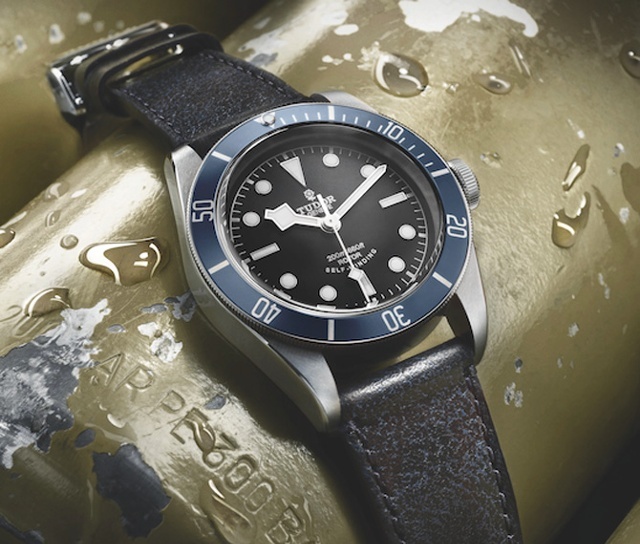 Debuting at BaselWorld 2014 this new Tudor Heritage Black Bay derives its overall lines and its domed crystal from the brand’s first divers’ watch, the Tudor Submariner reference 7922, launched in 1954. It also owes to its ancestor its domed dial, a feature shared by the first Tudor Submariner models, but which had since vanished. Its imposing winding crown is a nod to a model presented in 1958 under reference 7924 and dubbed Big Crown by collectors. Its characteristic angular hands, known by connoisseurs as Snowflakes, were seen from 1969 to the early 1980s. The 2012 Tudor Heritage Black Bay, with its black-chocolate dial, its pink-gold hands and hour markers, its creamy luminescent material and its burgundy bezel, is reminiscent of the gentle warm patina of an antique watch. For this second version, Tudor sought to convey through design details the intention governing the creation of the brand’s first divers’ watch: namely, to produce a technical and reliable divers’ tool-watch. While the first version radiated gentle, soft warmth, the face of the second is icy with sharp lines infusing it with a decidedly high-tech allure. ts deep-black dial strikes a cold, marked contrast with the silvery hour markers and their white luminescent material. The silver-colored, luminescent hands feature the same contrast as they cut across the dial with surgical precision. Finally, the bezel in midnight-blue, matching the colour of the crown tube, tempers the vibrancy of the steel case, while lending an aquatic and highly functional dimension that echoes the military past of certain brand references. Like all models in the Heritage line, the Tudor Heritage Black Bay comes with two bracelets or straps: an adjustable black and blue fabric strap with a sophisticated weave; and the other a choice of either a midnight-blue distressed leather strap matching the bezel, or a satin-finished and polished steel bracelet. Both come with a folding clasp.